NEW sachet of Napier Super VP90 Corrosion Inhibitor. This remarkable product is used by over 500,000 shooters worldwide to protect guns or any metal objects, either in a gun safe or bag. Advanced vapour phase action deposits an invisible mono molecular coating on any exposed metal, leaving glass, plastic & wood unaffected. Anywhere air can penetrate VP90 will protect. 1 cu metre (35.5 cubic feet) for over 9 months. DO NOT CONFUSE VP90 WITH SILICA GEL or similar desiccants. These products simply dry out the air within the confined space and can lead to serious damage to wooden parts of the weapon. A badly warped gun stock is a very expensive problem. VP90 is a blended vapour phase inhibitor which releases a controlled mono molecular chemical into the atmosphere. It is attracted to all metals, both ferrous and non-ferrous, and it will not adhere to wood, plastic or glass. It is safe to use on even the most delicate parts and will seek out exposed metal even in places that you cannot reach with the oil can. Anywhere air can penetrate VP90 will protect!! It leaves an invisible micro film coating on the metal which guards against the effects of corrosion and will continue to do so even in extremes of temperature or humidity. VP90 is the first product designed specifically for use in gun safes. The blend of active chemicals is safe to use and the activity will not be reduced by normal exposure to air movement. If you value your weapon, PROTECT it. For just a few pennies per week a VP90 sachet will protect any metal object within a 5 gun cabinet for over 9 months. Supplied with full instructions in a sealed package, VP90 packs can be placed inside any cabinet with the adhesive tab provided, or can be put inside your gun slip. (Most Napier gun slips are supplied with one pack of VP90). VP90 is made to complement the finest range of cleaners and lubricants you can use on your gun. 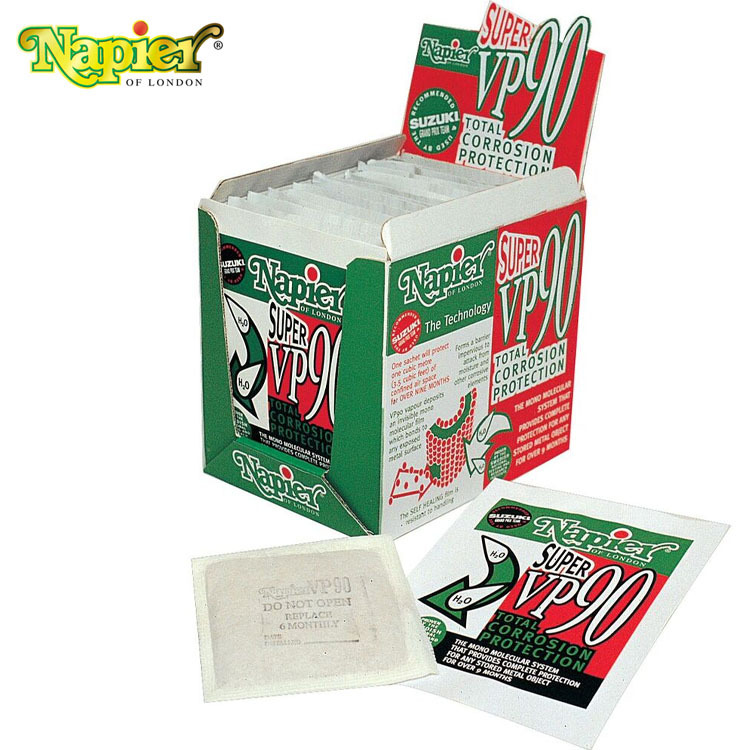 All the Napier range of cleaners and oils contain VP90 and, when used in combination, offer the most effective level of protection from the elements (and your fingers) that money can buy.